As most New Jersey dog owners know, your area of residence isn’t always perfect for having a dog around. Sometimes your neighborhood might be full of other dogs that misbehave often, and you don’t want your pet to become a victim of one of those troublemakers. There are some basic training methods you can implement into your dog’s routine that will ensure that your dog stays out of trouble and behaves well around others. When you train a dog, there are two different types of general approaches that have their own individual methods: ’don’ts’ and ’do’s.’ You generally teach your dog to do something, and you also teach your dog to not do something. When teaching your dog what to do, there are three different types of methods. The first is considered a lure reward method, in which the person training uses rewards to lure a dog to do what they want. This method is often used simultaneously with verbal praise and is one of the most practiced training methods for dogs. The second method is a compulsion praise method, in which the trainer uses physical manipulation in order to get the dog to do what they want. For instance, the trainer might physically push on the dog’s bottom to put it in a sitting position. This method isn’t the most popular, but some find it beneficial. The third method is known as marker training, in which the trainer uses a clicker or word to indicate when the dog is correct in its behavior. The marker is typically used immediately after the dog behaves correctly and before a treat or reward is offered. It helps create a separation between the two so the reward isn’t as much of an enticement or luring method. When you train your dog what not to do, you are typically doing one of two things: either training a replacement or incompatible behavior or using an undesirable consequence. The former method works by replacing an undesirable behavior and preventing the behavior the trainer dislikes. For instance, if your dog jumps up to greet people often, you can correct this behavior by teaching the dog to stand or sit on the floor when its owner comes in through the door. Standing and sitting are not compatible, but they each prevent undesirable behavior from happening. With the undesirable consequence, this is essentially using negative consequences for behavior that isn’t compliant with what the trainer wants. This is similar to using negative reinforcement when training. Regardless of how you choose to train your dog, there are plenty of methods to making sure it behaves properly. Another option for helping train your dog is to purchase a pet fence. Here at Dog Guard, we want to offer you the newest and most effective technology we can: the wireless, out-of-sight electric fence. New Jersey dog owners will love using this along with their other training methods for ultimate effectiveness. Our technology is simple: When you purchase our hidden fence, NJ installers will put a thin wire underground in the perimeter of your yard that connects through a radio signal to a receiving collar that is worn by your dog. In the initial days of training, boundary flags will be set up around the edges of the hidden fence; New Jersey owners will find that this helps tremendously with getting the dog used to the out-of-sight fencing. The best way to start out is to walk your dog on a leash along the edges of the fencing areas and use verbal commands to train your dog to stay away from the flags. When the system is officially activated for use, the collar worn by your dog will emit varying levels of stimulation according to how close it gets to the edges of the wireless dog fence. 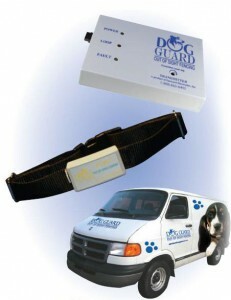 The collar won’t hurt your dog, but it will give off enough stimulation to alert the dog to stay away. This is what’s most effective about the electric fence: NJ dog owners will no longer have to worry about their pet running off when they are allowed outside. Without a containment system in place, you put your dog’s safety at risk in a number of ways. It could get into a fight with another animal or get hit by a moving car. You also give your dog more opportunities to misbehave, which isn’t conducive to training methods implemented. When making the choice to buy our wireless dog fence, NJ dog owners can feel secure knowing that their dog is becoming better-behaved while staying safe and having freedom.